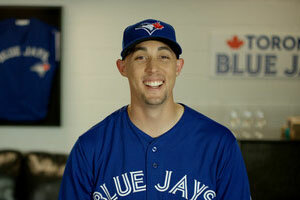 Just in time for this week’s Toronto Blue Jays’ home opener, WestJet has launched a new round of television ads featuring one of the team’s stars – Aaron Sanchez. Created by WestJet and its creative content agency, studio m, the campaign features Sanchez offering a tongue-in-cheek demonstration of WestJet Rewards, WestJet Plus, the airline’s caring brand, and the size of WestJet’s growing network. The four spots feature actual WestJet employees introducing Sanchez who is seen lounging in an ice bath, sitting in a tight spot, caring for a puppy and counting hot dogs. The ads will be broadcast on Sportsnet during Toronto Blue Jays games during the Major League Baseball season. Fans looking for more content, the game schedule and photos of Sanchez with puppies can also check out the WestJet Blue Jays hub at WestJet.com/Bluejays.